Delbaerov wrote: If you were to offer the staff $ to buy a box of say the 6 x 16 baseplates, would you be instantly shot down? Is there a way they could get away with that. Not that I'd want to encourage activity that could put their job at risk, but i'd just love a box of those baseplates in particular. Talk to Troy, the manager. 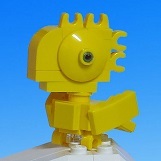 You may be able to get a "K-box" - see this online discussion: http://www.eurobricks.com/forum/index.p ... opic=44286. Good luck! Oakridge PaB updated: http://www.brickbuildr.com/view/pab/side/off/99/. Nothing too exciting this time. Oakridge PaB has just been updated: http://www.brickbuildr.com/view/pab/side/off/99/. The slot at 3 up 9 across is supposed to be white 1 X 4 X 3 window frames. For some reason, I could not find that on the list. dkan wrote: The slot at 3 up 9 across is supposed to be white 1 X 4 X 3 window frames. For some reason, I could not find that on the list. If you're a VLC member and are buying the 1x4x3 window frames, let me know before you purchase it. They brought out a box of 1x1 black brick studs on all sides (Travis bricks). As well, they have the Lego Christmas ornament for 50% off $4.99 (reg$9.99) It's the empty ones that you get to stuff with PaB elements. Great for stuffing olive or transparent cheese slopes into or in my case 119 Travis Bricks. White 2x2 round brick with grille are gone. some big green plate can't remember the dimensions. Still didn't see the 1 X 4 X 3 window frame on the list. Or it's listed under a different name? Row 5 column 1 is the black 1 X 1 brick with studs on 4 sides (Travis brick), but I could not find it on the list. Thanks for the continuous updates on the wall dkan. I really want Oakride to place an order on the 1x2 profile bricks that Guilford had a couple weeks ago. I went yesterday and they added three Pick a Brick bins of Friends colour random pieces. There were enough pieces to fill my free gift box, so I'm a happy camper! The wall is updated. Nothing too exciting except for the purple 1 X 2 tiles. Has anyone seen a 1x2 jumper plate on the PaB wall in any other colour than yellow? Ever? Same question with the 2x2 plate with corner (the L shape) in any other colour than tan? Ever? Dalek Brick: A Modified 1 x 1 with Studs on 4 Sides. Named after the evil race from Skaro - as featured in the TV series Doctor Who. Also known as a Travis. Hahaha...mine was not even close. Thanks, Tyler! Hi guys stopped off at oakridge today and they didnt have any green 1x4 tiles in stock,dissapointed that they were only there for a couple of weeks .Anyone have 10 or 15 to trade for something,I just want some street signs.I'd update the PAB website but I cant seem to log in. Lots of travis bricks there in stock. I have 15 green 1x4 tiles in my whole collection, I don`t really have a use for them... your welcome to have them. No trade item needed, you always help me with my mocs, let me return the favour. I can bring them to the next meeting if you like. Lee.